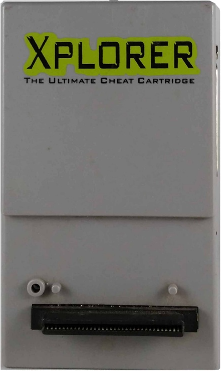 You might have heard of the different cheat cartridges that are available for the PlayStation: Action Replay, Smart Pro, Game Shark, Game Enhancer, Game Wizard, etc. Well the cheat cartridge that I have is an Xplorer (known as an Xploder in the US), an English made device that is way cool. The Xplorer plugs into the PlayStation's parallel port on the back of the console (newer PlayStation models don't have this port) and comes with thousands of cheats already programmed into it. The Xplorer handles all of the cheats designed for other cheat cartridges, which means that there are hundreds of websites out there with usable cheats. You can also use the Xplorer to explore game CD's (i.e. play music, search for graphics, etc) and also to access your memory card (delete and recover game saves, format the memory card, etc). But the best thing about the Xplorer is that it has a parallel port built in, enabling the user to hook up their PC to the cartridge. Other cartridges I looked at (i.e. Action Replay) required you to purchase a special I/O card for your PC before you could connect the cartridge to your PC. Hooking the cartridge up to your PC has several advantages: you can make your own cheat codes by using the freely available X-Link software, grab screen shots and save them as BMP files, transfer game saves between your memory card and your PC, transfer cheats between the cartridge and your PC. There are several Xplorer models available: Xplorer, Xplorer FX, Xplorer Professional. I've got the Professional model which includes a device called the X-Assist; a self contained code finding tool that interfaces with your Xplorer Professional so you can find your own cheat codes without having to use a PC. Personally I prefer using the X-Link software to find cheats, it's much easier to use and more powerful than the X-Assist. x-flash-v1.2 beta-3.zip X-Flash can be used for repairing broken Xplorer cartridges. x-killer-v0.55.zip Utility that allows you to upgrade the Xplorer's ROM. Has several features that X-Link doesn't have (i.e. no territory check when upgrading the ROM, extract xcheats.txt file from ROM files, a memory editor with no restrictions on viewing and downloading memory (Xplorer ROM / PSX BIOS), etc). xlink_dos_uk.zip The DOS version of X-Link. V1.09. xlink_95_uk.zip The Windows version of X-Link. V1.1. xploder.zip Useful information on how the Xplorer communicates with a PC, including pinouts. ts_xplorer_training.zip Tutorial on how to find cheat codes using X-Link. xplorer-faq.zip A huge amount of useful info about the Xplorer. x-caetla.zip Documentation on how to get the Caetla ROM working on the Xplorer. xplorer-eng-rom.zip Xplorer ROM V2.008 for standard Xplorer. xplorer-pro-eng-rom.zip Xplorer ROM V2.20 for the Xplorer Professional. xplorer-fx-eng-rom.zip Xplorer ROM V3.20 for the Xplorer FX. xplorer-fx-eng-v452-rom.zip Xplorer ROM V4.52 for the Xplorer FX. Dated 05/11/1999. Note: Many people have trashed their Xplorer by trying to upgrade their Xplorer to an incorrect ROM. Here is a list of what ROMs can be flashed to which cartridges. If you trash your Xplorer use the tools on this page to repair it. Cheat Code Central - Game cheats and codes, game manuals, saved games. World of PlayStation - Game cheats and codes, game manuals, saved games. Not Yaroze - PlayStation programming without official tools. PSX Chipmunk BASIC - Program in BASIC on your PlayStation.